I tried reading this book awhile ago, but I couldn’t get past the first half, in which King recounts his rise to super stardom. It’s not that I found King vain, which is the fault of many writers’ memoirs (see Nicholas Spark’s Three Weeks with My Brother, or the more appropriate title Why I’m Such a Genius. The segment on how he “cured” his son of autism was particularly galling). It’s just that there are a lot of books out there that I want to read, and a book filled with stories of Stephen King’s childhood just isn’t one of them. So I put the book aside. Turns out I threw in the towel just before it got good. A friend of mine at work keeps this book at his desk. I noticed it on the shelf in his cubicle, and so decided to give King another try. This time, however, I’d go with the audiobook. Perhaps another reader could bring life to what I didn’t find terribly compelling before. That turned out to be the case. The reader was King himself, and I was surprised to find that King can be charming and funny and a pleasant companion, someone you could sit down in your living room with and listen to for hours. The only other authors I’ve found who can pull this off are Orson Scott Card and Bill Bryson. 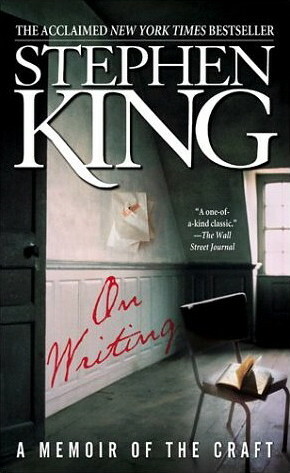 In any event, I relistened to the first half of the book and found it slightly more interesting, though even King couldn’t charm me through some of the bits. What I did enjoy hearing was how determined King was as a high schooler to write stories and get them published. It’s the best motivational speech anyone could give on the subject. The man was rejected into oblivion. And yet his love of the craft and story creation kept him on course, never deterred. You got to give props to the guy for that. And I also enjoyed the bit about him selling CARRIE, his first novel. A fairy tale story if there ever was one. Pretty neat. The latter half of the memoir is the book’s real treat, however. King discusses the ins and outs of a career in writing, answering those questions everyone asks (Where do your stories come from? How do I get an agent?) as well as those questions no one asks but should (What can you teach us about the language, the mechanics of style, dialogue and story construction?). Like any writer, King has his pet peeves: passive voice and most adverbs, to name two–novice writers like me will find these nuggets of wisdom particularly helpful. He emphasizes grammar, endorsing The Elements of Style as the tell-all textbook on the subject. He lets slip his opinion of literary critics and those who turn their noses up at writers like him whose work must be trash because it’s popular. He discusses plotting, and I found it fascinating to learn that he does little of it. King lets his characters dictate the story, which is how it should be of course, but were I to go without at least a rough outline, I think I’d quickly find myself way off in the bushes. Frankly, I suspect King does a great deal of plotting, just unconsciously. Writing solid stories is second nature to him. He doesn’t even notice himself plotting. It just happens naturally. Like riding a bike. He concludes the book telling the story of the terrible accident that befell him during the writing of it. Back in 1999, some crazed man nearly killed King when he ran over him with his van. It’s a pretty gory tale. The man’s lucky to be alive. And I’m glad he is. Because at the time of his accident, he was still not finished with either this book or his Dark Tower series, which I’m reading vigorously right now. If anything, On Writing motivated me to get off my tush and get writing. I’ve been doing my best to do just that, but my schedule at work, coupled with my desire to spend every remaining waking hour with my kids and Lauren, makes finding time for writing difficult. Were King to speak to me directly he’d say, “Shut up your whining and get writing! You either love the process enough to make sacrifices or you don’t.” Sadly for me, the only part of my life that I CAN sacrifice is sleep. I can’t quit my job, and I certainly won’t write at the expense of missing my kids’ childhood. So if anything goes, it’s sleep. Thanks a lot, Mr. King. Less sleep. Wonderful.